I'm trying to use the opening trainer in scid. I've set up a filtered database of master games in a particular opening, as described in the wiki. I was expecting some kind of interactive experience from there but, when I start the opening trainer, it just cycles through the moves in the database then offers me a report. What am I missing? Create a database of openings you want to study. Scid will select randomly from all variations of all games, so make sure you want to train on everything in that database. Open the database switcher and make sure your desired openings database is selected. Database > Maintenance > Maintenance Window (Ctrl + M). You should see your database name at the top. Next to the name of your database, click the image to the right of "Type Icon:" and select either "Openings for White" or "Openings for Black". Note that this option decides your selection in step 4. Let's say you select "Openings for Black"; the only option you can select in step 4 is to play as Black. If you want to play White, you'll need to either reclassify the database in the Maintenance Window or rotate the board (after you've selected to play black) and it will let you play the White pieces. "Openings for either color" allows you to select playing both sides in the Openings Trainer, but from what I've seen it'll just play one side anyway. 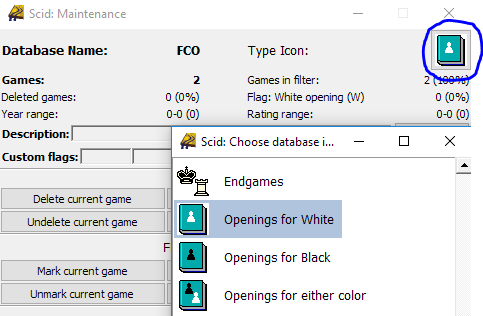 If desired, add additional flags for White or Black openings here in the Maintenance Window. I don't think this does anything for the Opening Trainer. You may need to restart Scid. Play > Training > Openings. Customize your options (such as which side you want to play) and hit Continue. Play a move and Scid should play the other side if you've selected either White or Black. Once it displays "End of variation" in the window that pops up, you can use the arrow keys to move back to move 1 (or select move 1 in the Notation) and it will randomly select another variation. If you're ever stuck on a move, click "Display candidate moves" in the pop-up and below that button it will show your options. Not the answer you're looking for? Browse other questions tagged training scid or ask your own question. Training plan for going from High Class A/Low Expert to National Master… Help? How to study a chess tactics book?